When Marius and Maria Viljoen established the 9 room Villa Maria Guest Lodge in 2001, they tapped into the things they loved – simplicity, minimalism, open spaces with fresh clean lines and passionate entrepreneurism. A Villa style architecture modern and neo classical buildings arose. It was an ad-on to the old 1950 Tudor Main House. The setting of the owners’ teamwork was an inviting, convenient and award-winning venue. Villa Maria Guest Lodge, with its now 24 rooms, in Klerksdorp, North West Province is simply amongst South Africa’s finest guest houses with its white buildings, scenic garden and tarred driveways. The Award winning Villa Maria Guestlodge is situated just off the N12 in Klerksdorp and lies close to the central business district, major shopping centres , gym, cinema, hospitals, restaurants and casino. Our relaxed atmosphere caters for the discerning business person, leisure traveler as well as romantic breakaways for couples. Our convenient and romantic venue is suitable for all occasions – from intimate events to elaborate affairs. Experience our top-class service responsibility that will exceed your expectations in beauteous surrounds. 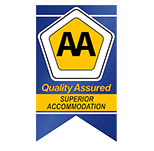 Nationally selected as a semi-finalist in the 2010 AA Travel Guides American Express Accomodation Award Program. 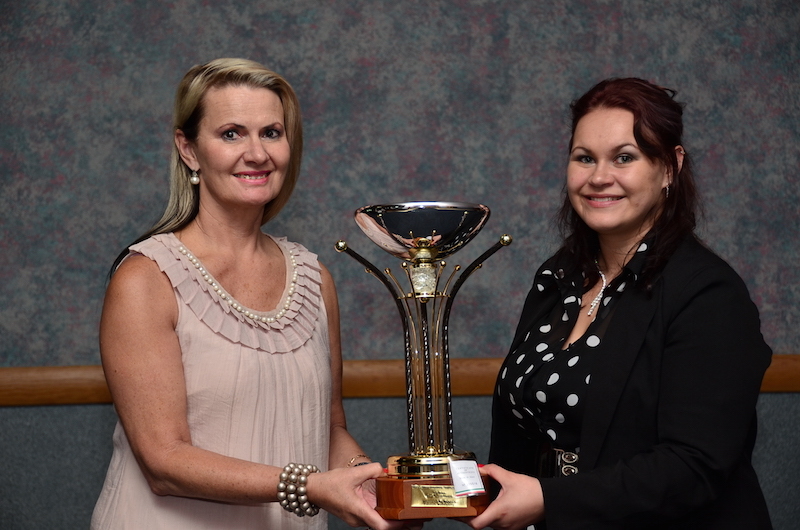 Villa Maria won the category of Best Guest House in the North West Province. 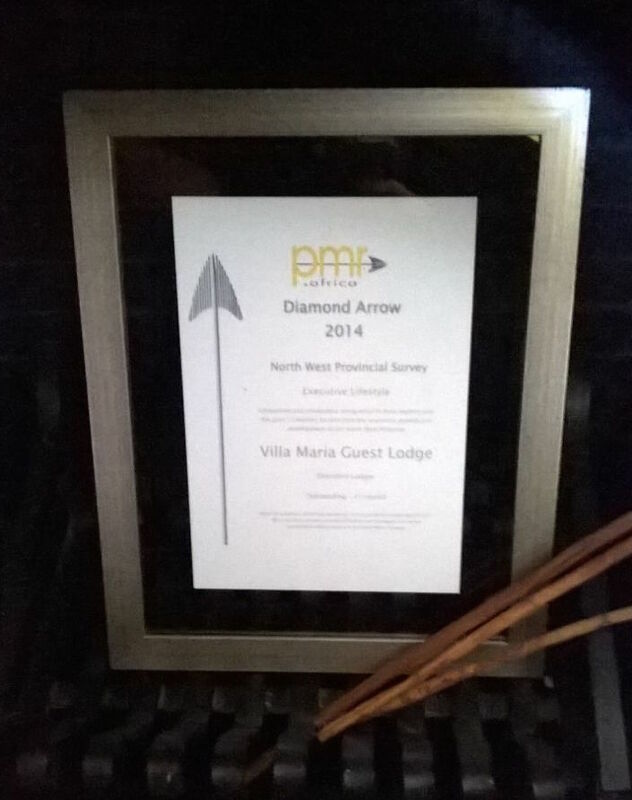 PMR Africa Diamond Arrow award for the 1st overall Best Executive Lodge. – This award is presented to companies and institutions doing the most in their sectors over the past 12 months to stimulate the economic growth and development if the North Wets Province. 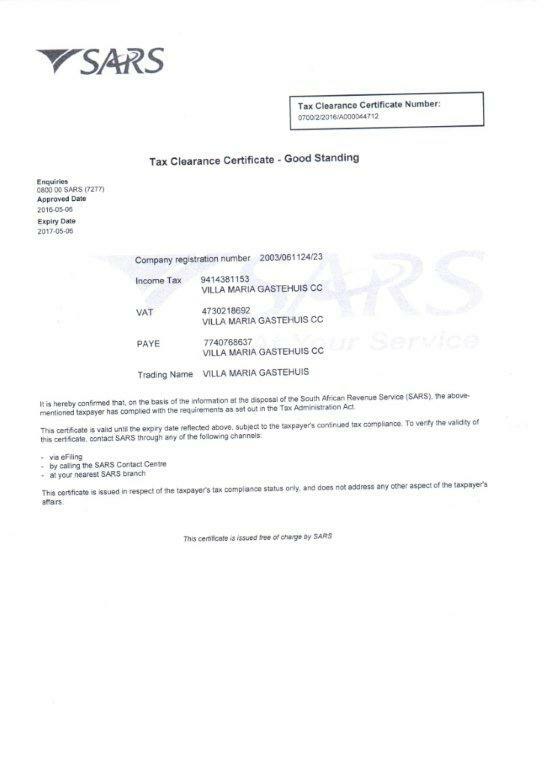 Villa Maria won another award on 18 September 2015. 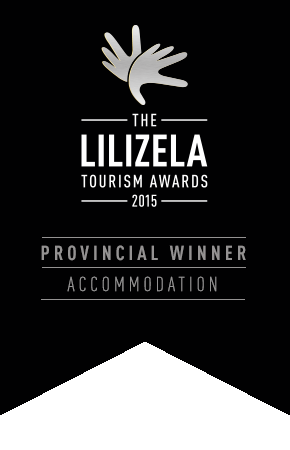 We won the category of Best Guest Lodge at the 3rd Annual Lilizela Provincial Awards. Read what our customers have to say about their experience at Villa Maria Guest Lodge, Klerksdorp, North West. romantic setting to spotless accommodation and upmarket decor in the room. will experience your exceptional service excellence. Dear Villa Maria, Kay, Alyson and all the other helping staff. On behalf of my husband Andre and myself we would like to thank you for the wonderful planning and event organisation for our daughters 21st birthday celebration. Mecé had a wonderful time as it shows in the photos. Our compliments to the kitchen Chefs and staff for the delicious food presented to our guests and the waitress on the excellent manner in their serving and waiting on the tables. 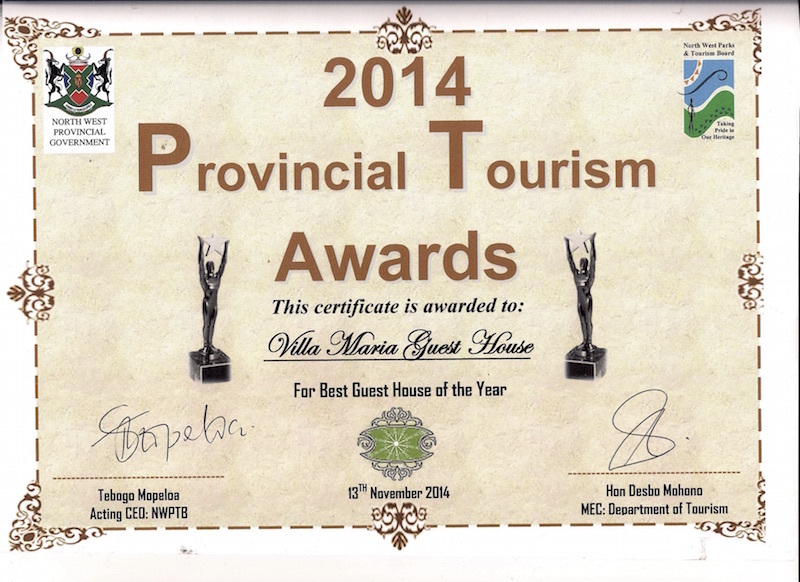 Heartiest congratulations on Villa Maria and Thaba Tshwene being voted best guest house and best lodge in our area. We are so proud to be able to say "I've been there!" May you and your business grow from strength to strength and enjoy the grace and favour of our Father above. Baie geluk van Klerksdorp Record en myself met julle toekennings gisteraand dit is wonderlike prestasies. On behalf of the Wesvaal Chamber of Business executive committee, we wish to congratulate Villa Maria, Thaba Tswene, Protea Hotel and Ngwenya hotel for winning best achievement awards at last night’s Dr Kenneth Kaunda District Tourism Awards. Copyright 2019 Villa Maria. Developed and Hosted by	Digibit Technology Solutions.